Spider-Man will fight a new, made-for-television villain during the premiere night of MTV's Spider-Man animated series. "Sword of Shikata" will air on Friday, July 11 at 10:30 p.m. as the night's second episode. It features the voice of Gina Gershon of Shikata, a warrior with a deep sense of honor who is hired by mogul Richard Damien to capture Spider-Man. 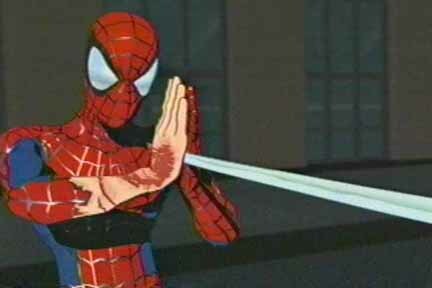 The episode, previewed to the press, shows an edgier side of Spider-Man than in previous animated versions. Shikata uses her sword to draw blood and decapicitate, and Spider-Man uses words like "damn" and "hell." Other voices include John C. McGinley as Richard Damien, Clancy Brown as Damien's thug and Ed Asner as Officer Barr. "Sword of Shikata" was written by Morgan Gendel and Todd Felderstein and directed by Brandon Vietti. Below are images from "Sword of Shikata." The first six images are from the show's opening theme, giving viewers a first look at J. Jonah Jameson, Silver Sable, Kingpin, Kraven the Hunter and Talon. Click on the thumbnails for larger looks and look for more Spider-Man news soon here in The Continuum. Titles include Adventures of Superman #618, Batman: Legends of the Dark Knight #169, Green Arrow #28, Blood and Water #5, Fallen Angel #1 and Fables #15. Tom Bancroft, creator of Opposite Forces, has announced that J. Scott Campbell will be providing the front cover and Phil Noto the back cover for Opposite Forces #3. The black-and-white issue will also feature pinups by some of Bancroft's friends from Disney animation, including one by Bancroft's twin brother and co-director of Disney's Mulan, Tony Bancroft, as well as Courtney Huddleston. Opposite Forces is published through Bancroft and Rob Corley's Funnypages Press. Opposite Forces is the story of two very different people, Marty and Alexis, who's lives are changed when the local superhero is attacked by an arch foe. Instead of being rendered powerless his powers are mistakenly split amongst Marty and Alexis. Now they have to deal with one another, mysterious new abilities, as well as an evil that they have accidentally unleashed on the world. "Having pinups by some of my comic book creator friends has been something I wanted to do well before I even started Opposite Forces," Bancroft said. "Having Jeff (Campbell) and Phil (Noto) do one was a huge deal! They are both cool guys and I knew they would want to but I also knew I was asking two of the busiest guys in comics right now so them actually doing it was incredible! My series has been blessed with some great art by Mike Wieringo, Humberto Ramos, and Francisco Herrera- and that was just the first two issues! This issue is going to go nicely with the other two. "Actually, I received such a great response of pinups for this issue that I had to move some of them over to next issue! Mike Kunkel and Frank Cho will be in next issue along with even more surprises. I know it's just an "indy comic" but I like to approach it as more of an 'event' since I can't put it out very frequently because of my busy schedule." Bancroft will be premiering Opposite Forces #3 at Comic-Con International in San Diego July 17-20 at the Funnypages Press booth. Freemind #8 is available from Future Comics. The issue is written by David Michelinie, pencilled by Bob Hall, inked by Brett Breeding and colored by Tom Smith, with a cover by Bob Layton. "Edison (Mac Flint) Wilde uncovers a technological menace in that threatens the security of the free world after following a trail that leads to his own Aerospace division. Plus: a FlinTech employee starts down the path to betrayal." Freemind #8 will be 22 pages and will cost $2.99. Here's a first look at the covers to Avengers #71 and Human Torch #6. Both Marvel books will reach stores in September. Coming Friday: First looks -- and much more!!! Industry insiders like Stan Lee and Neil Gaiman (The Sandman) reflect on the way their colorful creations reflect society at large.